For other places with the same name, see Colonsay (disambiguation). Colonsay (Scottish Gaelic: Colbhasa) is an island in the Inner Hebrides of Scotland, located north of Islay and south of Mull. The ancestral home of Clan Macfie and the Colonsay branch of Clan MacNeil, it is in the council area of Argyll and Bute and has an area of 4,074 hectares (15.7 sq mi). Aligned on a south-west to north-east axis, it measures 8 miles (13 km) in length and reaches 3 miles (4.8 km) at its widest point. Although Colonsay appears bare and somewhat forbidding on approach from the sea, its landscape is varied, with several beautiful sandy beaches, and a sheltered and fertile interior, unusually well-wooded for a Hebridean island. It is linked by a tidal causeway (called The Strand) to Oronsay. The highest point on the island is Carnan Eoin, 143 metres above sea level. The Colonsay Group, which takes its name from the island, is an estimated 5,000 m thick sequence of mildly metamorphosed Neoproterozoic sedimentary rocks that also outcrop on the islands of Islay and Oronsay and the surrounding seabed. The sequence has been correlated with the Grampian Group, the oldest part of the Dalradian Supergroup. In 1995 evidence of large-scale Mesolithic nut shelling, some 8,000 years ago, was found in a midden pit at Staosnaig on the island's sheltered east coast, in a large, shallow pit full of the remains of hundreds of thousands of burned hazelnut shells. Hazelnuts have been found on other Mesolithic sites, but rarely in such quantities or concentrated in one pit. The nuts were radiocarbon dated to 7003772000000000000♠7720±110 BP, which calibrates to c. 6000 BCE. Similar sites in Britain and its dependencies are known only at Farnham in Surrey and Cass ny Hawin on the Isle of Man. Recently there has been a growth of tourism as the mainstay of the island's economy, with numerous holiday cottages, many of them owned and managed by the Isle of Colonsay Estate. The Colonsay Hotel, the only hotel on the island, is also estate owned. Colonsay Hotel, the island's only pub and hotel. The island has a tiny bookshop specialising in books of local interest; it is also the home of the House of Lochar publishing company specialising in Scottish history. There is a hotel overlooking the harbour, a cafe and bakery, and a shop and post office. Colonsay's best known beach, Kiloran Bay, is a vast stretch of golden sands and draws locals and tourists alike while maintaining an isolated and peaceful atmosphere. In 2012 the island staged its first annual book festival which featured, amongst others, Alexander McCall Smith, James Robertson, and Scots Makar Liz Lochhead. The line up for 2013 was headed by crime writer Ian Rankin. 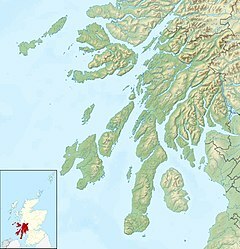 Colonsay's name derives from Old Norse and means "Kolbein's island" (although Haswell-Smith offers "Columba's island"). In the 14th century the name was recorded as Coluynsay and by Dean Monro in the 16th century as Colvansay. The modern Gaelic is Colbhasa. Scalasaig also has a Norse derivation and means "Skali's bay". Donald MacKinnon was born in Kilchattan on Colonsay, in 1839. In 1882, he became the first person appointed to the Chair of Celtic Studies at Edinburgh University. Professor MacKinnon was born on Colonsay in 1839 and held the Celtic Chair from 1882 until his death at Balnahard, Colonsay, in 1914. Between Cable Bay and Sir John's Pool on the south east coast with Islay in the distance. ^ a b Moffat, Alistair (2005) Before Scotland: The Story of Scotland Before History. London. Thames & Hudson. p. 91–2. ^ "The Estate". Archived 6 October 2013 at the Wayback Machine colonsayestate.co.uk. Retrieved 5 July 2010. ^ Watson, Rachel (4 October 2013) "Anger as laird blames crofters in gravel dispute". Glasgow. The Herald. Retrieved 5 October 2013. ^ "Colonsay Hotel" Archived 31 July 2010 at the Wayback Machine colonsayestate.co.uk. Retrieved 5 July 2010. ^ House of Lochar Publisher. "Mission Statement". Retrieved 2 August 2007. ^ "Colonsay Hotel". Retrieved 2 August 2007. ^ "Colonsay Brewery". Retrieved 24 April 2007. ^ "Hebridean beer pioneers win battle of the tiny islands". Retrieved 24 February 2013. ^ "Wild Island Gin – Proudly produced using hand foraged island botanicals". ^ "Hebridean policeman's lot is a happy one". Herald Scotland. 21 June 1993. ^ Paterson. S. (10 November 2006). "Colonsay's first house thief is fined £400". The Herald newspaper. Glasgow. Retrieved 29 November 2006. ^ "First crime recorded on Colonsay for seven years". The Scotsman. 28 June 2013. ^ "Home" and "History". Colonsay Rugby Festival. Retrieved 9 December 2013. ^ The Crofter and the Laird amazon.com Retrieved 7 February 2011. ^ "Ceol Chòlasa" Archived 1 February 2014 at the Wayback Machine ceolcholasa.co.uk. Retrieved 9 March 2014. ^ "SpringFest Annually". http://www.colonsayspringfest.co.uk/ Retrieved 7 February 2017. ^ "Home". Colonsay Book Festival. Retrieved 5 September 2012. ^ "Grave Location For Holders of the Victoria Cross in Strathclyde". Prestel. Retrieved 30 January 2014. ^ Dinwoodie, Robin (31 May 2010) "The boy from Colonsay takes on critical job at Treasury". Glasgow; The Herald. Watson, W. J. (1994). The Celtic Place-Names of Scotland. Edinburgh; Birlinn. ISBN 1841583235. First published 1926. Wikimedia Commons has media related to Colonsay. Wikivoyage has a travel guide for Colonsay. This page was last edited on 3 February 2019, at 12:15 (UTC).